My Home The Block is an intimate portrait of 83-year-old Aboriginal Elder Joyce Ingram, resident of the first inner-city land grant allocated to the Indigenous people that would become a symbol for Indigenous land rights—the infamous Redfern Block ("The Block"). Joyce has lived on The Block when it was the first urban land rights victory for Indigenous Australians in the 1970s. Her strong sense of community, her values and faith fuel a determination to save her people from the drugs, crime and loneliness that inhabit this tragic urban landscape. This observational documentary follows Joyce's struggle over several years to save her home and her community from irrevocable destruction through cultural decay as well as physical demolition by developers. Her strong religious beliefs and defiant spirit compel her to oppose relocation and she is left living in the last house standing on Eveleigh Street. This is a window into a tough world. It exposes the daily struggles of an urban Indigenous community and an elder's resilience, compassion and love. 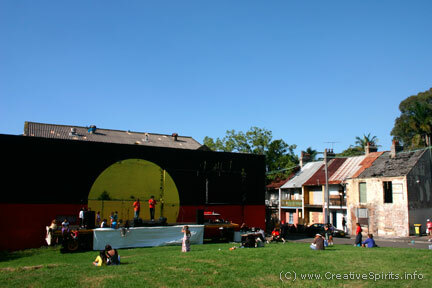 The Block, Redfern is also home to the occasional Aboriginal Family Day with music, stalls and a friendly get-together without alcohol. My Home The Block was shot on location in Redfern.